While it may come as news to many consumers this fact, revealed by Ana Allende, a food microbiologist with CEBAS-CSIC, will not surprise her colleagues working on a major European research project on food safety. It is precisely to further minimize those risks that European researchers are carrying out work right at the coalface, so to speak. Futuris visited one salad processing factory near Bremen, in Germany to find out more. Around 100 tons of vegetables are processed at the plant each week, including 20 tons of its prime product, lollo bionda lettuce. For the factory’s managers the big challenge is to provide their customers with a fresh, crisp and safe product without food additives. “We ensure the salad maintains a stable temperature, so it cannot expand and shrink,” said Benjamin Heinemann, Managing Director of Heinemann GmbH. The first step involves sensory analyses of the produce; its appearance, texture, taste and smell vary depending on how long it has been packaged. The packaging material and method are also factors, according to . Imke Matullat: “We have shown in our research that not only the time of storage is important but also the temperature at which it is stored, the humidity: did the atmosphere change? – this is often the case with salads. Chemical and microbiological analyses help researchers understand how the packaged vegetables behave overtime, and in which ways microorganisms or unwanted by-products eventually change, if at all, the quality and safety of the produce. The data obtained has helped develop web-based software that estimates the effect of each production step on the quality and safety of different kinds of fresh vegetables. Benjamin Heinemann confirms the advantages of such software: “The software allows me to work faster. If there is a problem I can have a simulation and the program can show me where the problem lies – and also what I can change: which components, which methods, so that the final product is fresh. “With the help of the software we hope to be able to put into place a new processing formula in a faster way. We also hope that our products will remain tasty for a longer time, and have a longer shelf-life without adding preservatives”. Around one million kilos of salad are grown each season at the huge plantation that was our destination, primarily, spinach, rocket and lettuce. Its fields provide an ideal open-air laboratory for researchers trying to understand if and how climate change affects crops. If existing climate change models are right, southern Europe will face significant water scarcity in the future and scientists want to know in which ways that will affect the quality and safety of produce, as Mabel Gil, a food microbiologist with CEBAS-CSIC explained: “We’ve come to the conclusion that 25 % less water during irrigation can in fact be beneficial. Both to the environment, since you are using much less water, and to certain vegetable products, as they may have a longer shelf-live”. Water scarcity, researchers believe, could eventually be compensated for by a number of actions, whose effects are currently under scientific scrutiny. “You can find species more resistant to water scarcity. You can also develop different nutrients, you can for instance add more nitrogen to the product, so it can maintain a good quality. And we’re studying if alternative water sources can eventually be used; like water from treatment plants. We are trying to see if vegetables irrigated with this water would safe enough and have a good shelf life,” added Gil. Scientists want also to understand how pathogens, toxins, pesticides and other factors affecting vegetables’ safety and quality – pre and post-harvest – evolve in a changing climate that is anticipated to be be drier in southern Europe and warmer but more humid in northern Europe. “We thought that the more humidity the better for both quality and safety of the products. But now we understand that humidity helps the survival of certain pathogens. So we are advocating reducing a bit the extreme humidity – down to 95-96 percent of what is used before the processing of these products,” said Gil’s colleague, Ana Allende. 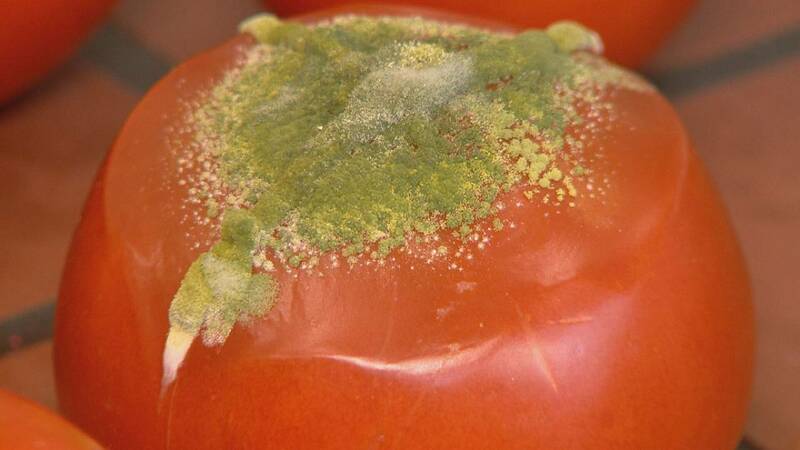 At Ghent University in Belgium, researchers are focusing among other things on how moulds in fresh tomatoes might evolve under extreme weather events. Liesbeth Jacxsens, a bioscience engineer. Further research is necessary, scientists think, to accurately assess the complex impact of emerging risks like climate change on the safety of fresh products. “But we can not predict exactly in a quantitative way. So it is a complex issue of several factors: climate, the plant physiology and their variety, the environment, but also the microorganisms; these microorganisms will adapt to climate change. “There might be some positive effects on that adaptation. And some negative effects from climate. So what we’ll win at the end it is a combination of both of them. And it should not always be negative. Because in the northern countries, they will have longer seasons, maybe, so they will have more opportunities to grow some fruits and vegetables”. The researchers conclude that increased vigilance related to the use of water, hygiene requirements and effective packaging and storage will be necessary to take the safety of fresh food products to the next level. “It is a pity that we can not define what is safe,” mused Ghent University nutritionist Jessica Nanyunja.“It keeps on raising the bar. Also the countries should harmonise, because what I define as safe may not be safe for you”. Mieke Uyttendaele of Ghent University: “We should always be aware. And watch out new evolutions, new threats like climate change or globalisation. So keep alert. And reinforce, specially on training and awareness”.